Being a hot-natured person, I am very much a cold weather fan, so up until about mid-April I was dreading this warm (hot) weather, but I must say – I’m pretty excited about summer break! I have decided to embrace the seasons. Summer is coming whether I’m ready for it or not, so I may as well get excited about the things you can only do when it’s warm outside. We enjoy letting the kids run around and play outside, jumping in the pool to cool off (my parents put in a pool last year, and we LOVE having it to play in), eating dinner outside, and topping it off with some cold ice cream or a Popsicle. I know it’s not technically “summer” yet, but we’ve got several things on our “Summer bucket list” this year and we may as well start checking them off now! Some of these we’ve accomplished already, but would like to do again. Some activities we have done in years past and they made it to our list again. Some are new that we would like to try out this year. If you’re in the Huntsville area, you may want to try out some of these local events and activities. If you are not from the Huntsville area, I encourage you to find out what summer events are going on in your town! There may be similar happenings in your area that you could enjoy as well. This is something we wanted to do last year, but never made it out there. These are FREE showings of family friendly movies – just bring a blanket or a chair! The Movies in the Park are held at Big Spring Park in downtown Huntsville and at The Village of Providence (check here for the schedule. It seems that the downtown schedule is not out yet, but if you check back to this site, it should be up soon.) There will also be a couple of outdoor movie showings at the new Madison Public Library! One of my girls’ favorite activities. Our favorite is Palmer Park on Palmer Rd. I’ve mentioned before that our membership to the Huntsville Botanical Garden is one of our favorite Christmas gifts, because it allows us to enjoy this place several times a year. (We had actually planned to go yesterday but the weather didn’t cooperate!) Our girls love the childrens’ garden, especially the little wading pond and pop jets. I love it too because parents can sit along the edge with their feet in the water and cool down as well! Be sure to bring a change of clothes, because they will get soaked! Nothing brings on the feeling of summer more than that sweet smokey smell of a grill. I love sitting outside on a nice breezy night, when the sun is starting to make it’s descent and enjoying dinner with family at the patio table. Goal this summer – swim a whole bunch and get a nice tan. The end. This is one we got to cross off already, but I included it in case it’s something you’d like to do. Or maybe just something to keep in mind for next year. We had a great time at Brown Farms picking strawberries for Mother’s Day! The girls had fun competing to see who could find the best looking strawberries. 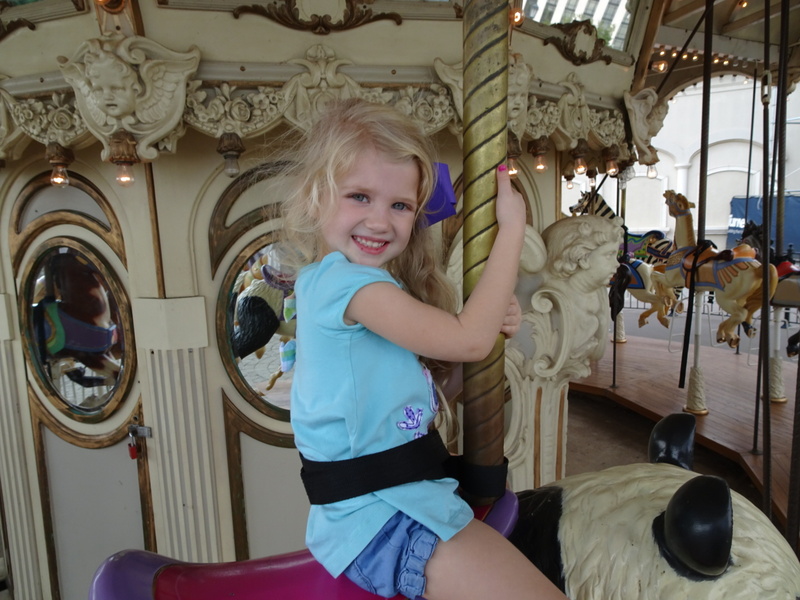 This is another favorite Christmas gift – unlimited carousel passes at Bridgestreet. It’s something we do just about every time we’re there and we don’t have to worry about shelling out money for it each time or telling the girls no because we don’t want to spend the money. The pass is definitely well worth it. If you haven’t already, put it on your Christmas list for next year! Something else I’ve wanted to do but just haven’t. I always decide to take the girls to do something they will enjoy more than riding in a stroller. But I do want to make it out there this year, partly because I need to start exercising more. Walking the Greenway is more fun with a friend, so who wants to join and push their littles along side me? There’s not much more fun to a little kid than playing in summer rain and splashing in rain puddles. We splashed around in puddles a few weeks ago but it wasn’t raining very hard. I plan to let them get soaking wet and play in the rain at some point this summer. The joy on their faces is heart melting! Much like playing in the rain, the pure joy on kids’ faces when they run around in pop jets is so much fun to watch! We like to go to the fountain at Bridge Street, but there are others around town that you can enjoy as well. As you probably know, I’m obsessed with the zoo. We went to the Birmingham zoo a few weeks ago, but we are hoping to make it to a few others over the summer. This is one summer drink that I love but I’m honestly not sure the best place around here to get one (any ideas?) I know Chic-fil-a has them and they’re pretty good, but I wonder if I’m missing out on something better. If you’re heading to the beach this summer, be sure to stop at Peach Park in Clanton, AL and grab you some peach ice cream or a peach milkshake. I wish we were going to be down that way, because theirs are seriously the best! I always enjoy browsing through a Farmer’s Market, picking up fresh produce and shopping at local booths. There are several around town (list here) but my favorite is Greene Street Market, mostly because my girl Katie from La Rue Macarons has a booth there. If you want the best macarons in the area, be sure to visit her and try them out. (Seriously, I’ve tried like every macaron you can try in North Alabama and none of them compare to hers!) She’s not there every week though, so be sure and follow her on Instagram to stay up to date on when she’ll be at the market. Or just go ahead and order a dozen! You won’t regret it! The ice cream truck tends to drive around at inconvenient times in our neighborhood. Either we’re sitting down eating dinner, or we don’t have any cash on us, or it’s late and we’re getting the girls ready for bed. But one of these times we are going to stop what we are doing and just go out and get some. Because every time we hear it we say “Agh, we really want some ice cream but….” Summer goal: take the girls to get ice cream from the ice cream truck, no matter what time of night it is. Ooh, buddy, do the girls love Let’s Play! We actually went yesterday. I don’t necessarily like taking them by myself because it is hard to keep an eye on both of them in the big play area, especially when they want to do different things. Even though they have security measures in place, I still get super nervous one of them will get lost and end up at the top of the play area crying because they can’t find me. Or that someone will somehow find a way to take them (the things you worry about as a mom!) Next time we’ll go with friends! I wish I could add “build a sand castle” to the list, but we’re just not going to make it to the beach this year. If you go to the beach, stop and get you a peach milkshake and wiggle your toes in the sand for me when you get there! 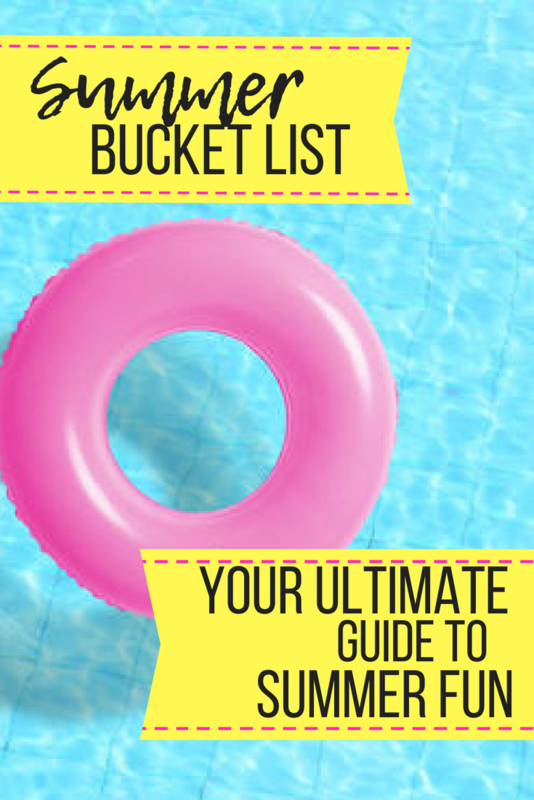 Are there any items on this list that made it onto your summer bucket list as well? Is there anything you would add? What is your idea of a perfect summer day? Yes!! I'm sure Mimi would love for you to come swim!